Fourth Row Center: Film Writings by Jason Bailey: Tribeca: "Legacy"
Thomas Kimi’s Legacy is a puzzle; it should work, and has all of the elements in place to work, and then it doesn’t. It has a crackerjack opening, and an intriguing political allegory at its center, and Idris Elba acting up a storm in basically every scene. But it never connects from moment to moment, and those discombobulated moments end up being slung together into a particularly unsatisfying trick ending. In the slick, rapid-fire action sequence that kicks the picture off, an elite “black ops” unit led by Adenuga (Elba’s old Wire colleague Clarke Peters) botches a mission to take down a Ukranian arms dealer. 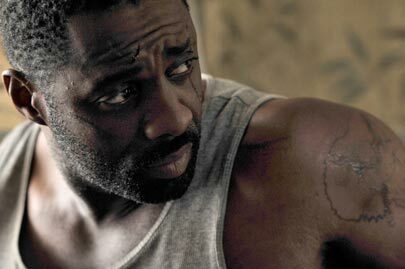 Malcolm Gray (Elba) is subjected to brutal physical and psychological torture, so when he returns to America, he’s looking to even scores—he reaches out to a reporter (Lara Pulver) with information about the secretive unit, and holds his brother, Senator Darnell Gray Jr. (Eamonn Walker) responsible. Senator Gray is a fierce hawk and national security booster; he was a major player in the formation of the unit. He has also, in the time Malcolm was gone, married Malcolm’s girl Valentina (Monique Gabriela Curnen). Aside from that opening (and flashbacks to it), the entirety of the action is contained to the dingy Brooklyn apartment that Malcolm rents upon his return. Within that space, Kimi (and cinematographer Jonathan Harvey) create an atmosphere of itchy paranoia, of walls tightening, closing in. The atmosphere is sweaty and nervous, even if you ding Kimi for using the tired device of the phone that won’t stop ringing. He also has a resourceful action sense; there’s a rough-and-tumble fight scene inside the apartment in which he eschews conventional score and uses, instead, the sound of a teapot whistling on the stove. Elba is credited as an executive producer on the film, and you can tell why he wanted to get it made—at times, it plays less like a narrative than like his actor’s demo reel. His work here veers between grounded and heart-wrenching and wildly overheated, with stops at all points in between. The role provides him opportunity for some Stringer Bell-style quiet intensity, which comes across better than when he bugs out and plays crazy. His monologue confessions into a video camera are a contrivance, but he mostly brings them off. It is, no question, a tour-de-force performance, but self-consciously so—he’s so busy studiously performing that he seldom seems to actually disappear into the character. We’re watching an actor working very, very hard. Some of the smaller details are bothersome. The key TV interview with Senator Gray is too smoothly and too obviously scripted, with none of the spontaneity of real television news—and that goes double for the clever ending, which is nearly wrecked by some egregiously bad acting by the TV reporters. But the main disappointment, as the close of Legacy’s 95 minutes, is that we slowly begin to realize that (contrary to the set-up), the film is not about character or story. It’s about narrative trickery. When the film’s bag of tricks is empty, we can go home. "Legacy" screened at the 2010 Tribeca Film Festival. Fascinating exposure to the movie. I particularly liked the vibrant sound effects, from the deafening explosive gunfire to the subtle resonances that perfectly complemented the claustrophobic apartment setting, and the minimal but effective score.